The Airhawk seat pad was originally developed for the medical community to equalize weight-bearing areas of the body and relieve pressure points. Made of either neoprene or more affordable polyurethane plastic, interconnecting cells flow air from one cell to another at a controlled rate, reducing vibration and absorbing shock. 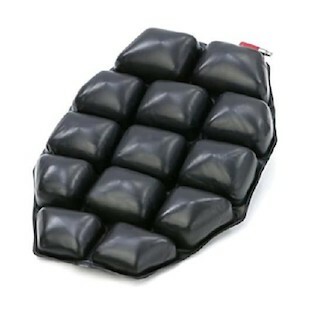 The seat cushion designed for motorcycle riders facilitates longer riding days with increased comfort. It's also a less expensive option than a custom seat and transfers easily from one bike to another. Several different shapes are available for the rider seat, in addition to a pillion pad. 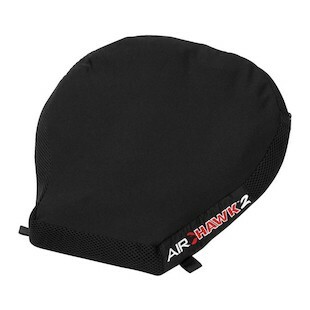 The Airhawk comes with an air bladder, a cover with a rubberized bottom to prevent slipping off your OEM seat, and straps to secure it in place.